Do you ever think of soldiers as dancers? In Scotland, warriors danced over the blades of two crossed swords before and after battles. They were very careful not to touch the swords with their feet while they danced. They believed that touching the swords would bring them bad luck. Today, most Scottish dancers aren’t soldiers. But the soldiers’ folk belief about not touching the swords is still a key part of the dance. The Sword Dance is one of many in Scottish Highland Dance, and one that the Heather Highland Dancers perform. Scotland is in northern Europe, part of the United Kingdom with England, Wales and Northern Ireland. The Highlands is a very hilly region in northern Scotland. A unique culture developed in the Highlands and dance is a large part of that culture. In the Scottish Highlands, the tradition of dance is part of the region’s folklife. 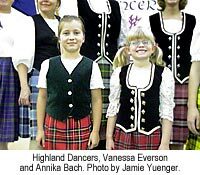 In Madison, the Heather Highland Dancers gather once a week to learn different Highland dances. They perform in the Madison area at schools, libraries, and festivals. A few of them compete in the annual Milwaukee Highland Games. The rest of the group cheers them on. 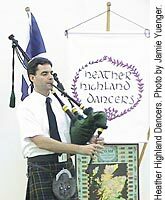 Some of the members of Heather Highland Dancers have Scottish ancestors but some don’t. Some dance because they want to honor their Scottish heritage. Some dance because they love the music and the movements. Some dance because the group is intergenerational. These mothers and daughters and fathers and sons like learning and dancing together. The members of Heather Highland Dancers love Highland dance. What makes Highland dance so special? Let’s find out!